Sandwich Cremes Vanilla & carob cookies with cream filling. Made with natural, human-grade and kosher ingredients. No animal parts and by-products. 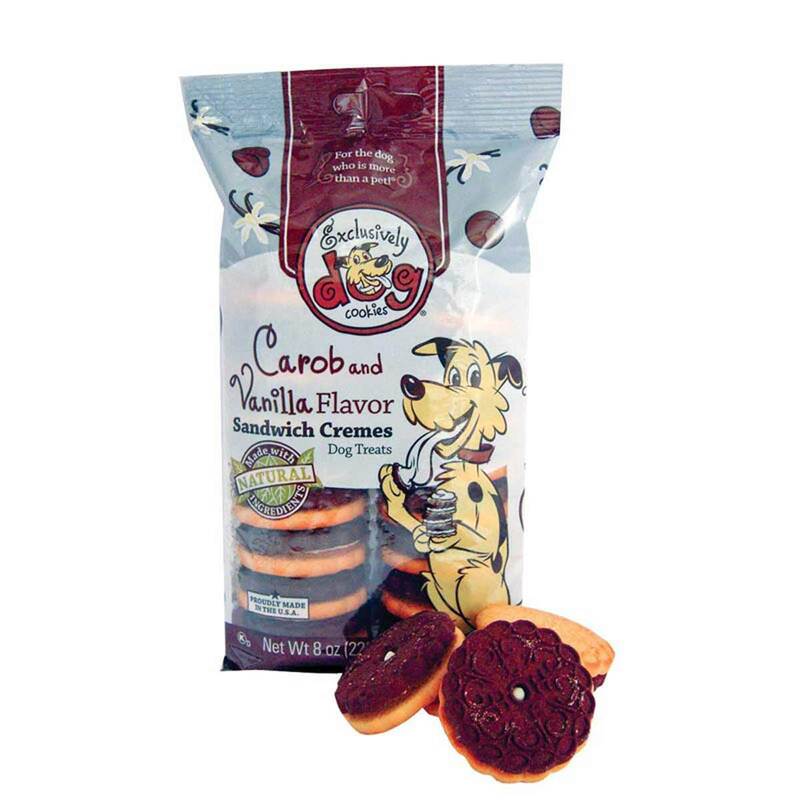 Dogs love these cookies. All-Natural products with the unique quality and resemblance to popular human cookies. These human-like treats are fun for both the dog and owner. The dog thinks it is getting a delicious human treat and the owner knows that they are giving a quality treat that is safe and specially formulated for their pet. Guaranteed Analysis: Crude Protein (Min.) 5% | Crude Fat (Min.) 18% | Crude Fiber (Max.) 1% | Moisture (Max.) 6%. Ingredients: Wheat Flour, Sugar, Vegetable Fat, Fructose, Dried Ground Carob, Caramel Color, Corn Syrup, Dried Milk, Soy Flour, Dextrose, Lecithin, Salt, Dried Whey, Natural Vanilla Flavor, Garlic Powder, Sodium Bicarbonate, Turmeric. Nutrition & Feeding Facts: Calorie Information ( Per Treat ): 46.6 General Feeding Guidlines ( Dog Size ): Toy 1-2 treats per day, Small / Medium: 2-3 treats per day, Large: 4-5 treats per day. Serving Size 3 cookies-30 grams | Calories 140 | Calories From Fat 50 | Total Fat 6 g | Saturated Fat 1.5g | Cholesterol 0mg | Sodium 80mg | Total Carbohydrate 20g | Dietary Fiber <1g | Sugars 10g | Protein 1g.